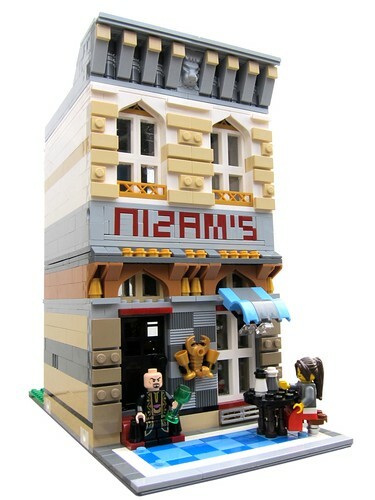 Brick Town Talk: Nizam's Persian Restaurant - LEGO Town, Architecture, Building Tips, Inspiration Ideas, and more! Nizam's Persian Restaurant, originally uploaded by gotoAndLego. First off I would like to apologize for my leave of absence. School's coming around, so I must keep up with that. Thanks for staying with us! Now onto this terrific creation. The mix between the middle-eastern architectural details and the "small town" look to makes for a fantastic view. The colors are rarities themselves, and who can't love that sign? Great use of a Prince of Persia castle. I love the ladie's curved legs (not a sentence i thought I'd ever say) and the canopy using car mud guards. Very clever.